So just to prove that I don’t only eat Indian food I thought I’d show you the salad I threw together tonight. The great thing is I didn’t have to prepare anything except for toasting the sesame seeds and pine kernels, oh and the marinated peppers had been prepared in advance. 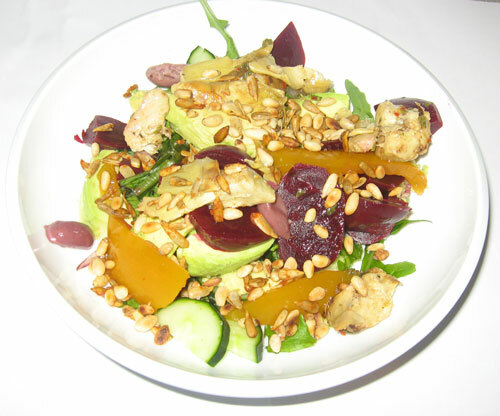 It’s a rather decadent salad as well without being to evil either …. perhaps a contradiction ? I’ll let you decide for yourself. Clean and spin the salad leaves and toss them in a salad (duhh) bowl. Assemble all the ingredients on top of the salad leaves – throwing the dry roasted pine kernels on last and then sprinkle with your favourite dressing. The image above is before the dressing has been added but all I used is some balsamic vinegar. 2 Responses to "Easy Vegan Gourmet Salad"
There’s nothing wrong with eating Indian all the time. But there’s also nothing wrong with salad. It looks awesome! I’m with Mihl on this – there’s nothing wrong with eating Indian food every day (isn’t that what Indians do????!) But HELLO SALAD! That looks delicious.